Has Government Gotten Bigger or Smaller? Yes. Politicians and pundits constantly debate the size of government. Is it big or small? Growing or shrinking? The blue line shows how much federal, state, and local governments directly contribute to economic activity, measured as a share of overall gross domestic product (GDP). If you’ve ever taken an intro economics class, you know that contribution as G, shorthand for government spending. G represents all the goods and services that governments provide, valued at the cost of producing them. G thus includes everything from buying aircraft carriers to paying teachers to housing our ambassador in Zambia. At 19.5 percent of GDP, G is down from the 21.5 percent it hit in the worst days of the Great Recession. As Catherine Rampell of the New York Times pointed out last week, it’s also below the 20.3 percent average of the available data back to 1947. For most of the past 65 years, federal, state, and local governments had a larger direct economic role producing goods and services than they do today. There’s one notable exception: today’s government consumption and investment spending is notably larger than it was during the economic boom and fiscal restraint of the late 1990s and early 2000s. From mid-1996 to mid-2001, government accounted for less than 18 percent of GDP. Relative to that benchmark, government is now noticeably larger. The orange line shows a broader measure that captures all the spending in government budgets—all of G plus much more. Governments pay interest on their debts. More important, they make transfer payments through programs like Social Security, Medicare, Medicaid, food stamps, unemployment insurance, and housing vouchers. Transfer spending does not directly contribute to GDP and thus is not part of G. Instead, it provides economic resources to people (and some businesses) that then show up in other GDP components such as consumer spending and private investment. 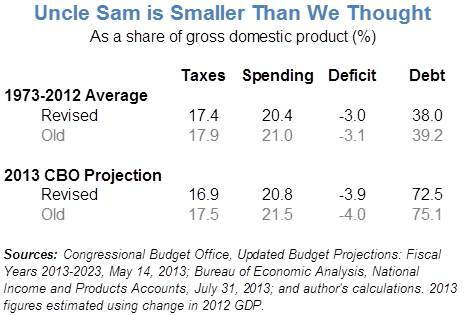 This broader measure of government spending is much larger than G alone. In 2011, for example, government spending totaled $5.6 trillion, about 37 percent of GDP. But only $3.1 trillion (20 percent of GDP) went for goods and services. The other $2.5 trillion (17 percent) covered transfers and interest. Like G, this broader measure of government has declined since the (official) end of the Great Recession. Since peaking at 39 percent in the second quarter of 2009, it has fallen to 36 percent in the second quarter of 2012. Also like G, this measure has grown since the boom of the late 1990s and early 2000s. In the middle of 2000, government spending totaled just 30 percent of GDP, a full 6 percentage points less than today. The two measures thus agree on recent history: government has shrunk over the past three years as the economy has slowly recovered from the Great Recession and government policy responses have faded. But government spending is still notably larger than at the turn of the century. The story changes, however, if we look further back in time. Although governments spent more on goods and services in the past, total spending was almost always lower. 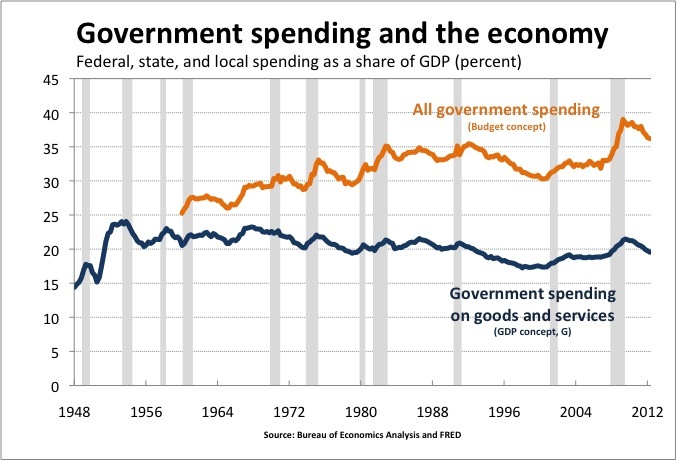 Since 1960, when data on the broader measure begin, total government spending has averaged about 32 percent. It never reached today’s 36 percent until 2008, when the financial crisis began in earnest. Much of the recent increase in overall spending is due to the severity of the downturn. But that’s not the only factor. Government’s economic role has changed. As recently as the early 1960s, federal, state, and local governments devoted most of their efforts to providing public goods and services. Now they devote large portions of their budgets to helping people through cash and in-kind transfers—programs like Medicare and Medicaid that were created in 1965 and account for much of the growth in the gap between the orange and blue lines. Government thus has gotten bigger. But it’s also gotten smaller. It all depends on the time period you consider and the measure you use. P.S. Keep in mind that this discussion focuses on a relative measure of government size—the ratio of government spending to the overall economy—not an absolute one. Government thus expands if government spending grows faster than the economy and contracts if the reverse is true. P.P.S. Measuring government size poses other challenges. Eric Toder and I discuss several in our paper “How Big is the Federal Government?” Perhaps most important is that governments now do a great deal of spending through the tax code. Traditional spending numbers thus don’t fully reflect the size or trend in government spending. For more, see this earlier post. The economy grew at a tepid 1.5% annual rate in the second quarter, according to the latest BEA estimates. That’s far below the pace we need to reduce unemployment. Housing investment expanded at almost a 10% rate in the second quarter, its fifth straight quarter of growth. Government spending declined at a 1.4% rate, its eighth straight quarter of decline. Are Two Economic Clocks Better Than One? A man with one clock always knows the time. A man with two clocks is never sure. This week brings the two heavyweights of economic statistics. On Thursday morning we got the latest read on economic growth, and on Friday we learn how the job market fared in May. Government statisticians and outside commenters usually emphasize a particular headline number in these reports. For the economy as a whole, it’s the annual growth rate of gross domestic product (GDP), which logged in at a mediocre 1.9 percent in the first quarter. For jobs, it’s the number of nonfarm payroll jobs created in the past month (115,000 in April, but that will be revised on Friday morning). In each case, the government also reports a second measure of essentially the same thing. Jobs day aficionados are familiar with this. The payroll figure comes from a survey of employers, but the Bureau of Labor Statistics also reports results from a survey of people. That provides the other famous job metric, the unemployment rate, and a second count of how many people have a job. The concept isn’t exactly the same as the payroll measure–it includes a broader array of jobs, for example, but doesn’t reflect people holding multiple jobs–but it’s sufficiently similar that it can be an interesting check on the more-quoted payroll figure. The downside of this extra information, however, is that it can foster confusion. In April, for example, payrolls increased by 115,000, but the household measure of employment fell by 169,000. Did jobs grow or decline in April? Another, less well-known example happens with the GDP data. The Bureau of Economic Analysis calculates this figure two different ways: by adding up production to get GDP and by adding up incomes to get gross domestic income (GDI). In principle, these should be identical. In practice, they differ because of measurement challenges. As Brad Plummer notes in a piece channeling Wharton economist Justin Wolfers, the two measures tell somewhat different stories about recent economic growth. 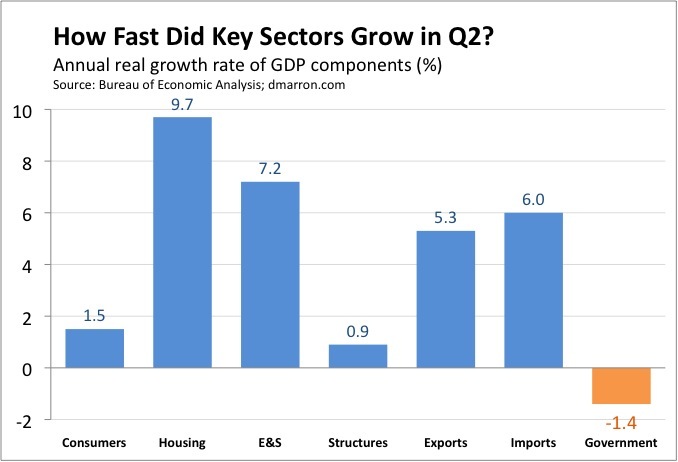 In Q1, for example, GDI expanded at a respectable 2.7 percent, much faster than the 1.9 percent recorded for GDP. Is the economy doing ok or barely plodding along? Such confusion is the curse of having two clocks. We can’t be sure which measure to believe. Experts offer good reasons to prefer the payroll figure (e.g., it’s based on a much larger survey) and GDP (e.g., income measurement is difficult for various technical reasons, including capital gains). But there are counterviews as well; for example, at least one paper finds that GDI does a better job of capturing swings in the business cycle. Despite this confusion, two clocks are better than one. They remind us of the fundamental uncertainty in economic measurement. That uncertainty is often overlooked in the rush to analyze the latest economic data, but it is real. There are limits to what we know about the state of the economy. In addition, a weighted average of two readings may well provide a better reading than either one alone. If one clock says 11:40 and another says 11:50, for example, you’d probably do well to guess that it’s 11:45. Unless, of course, you have reason to believe that one clock is better than the other. P.S. 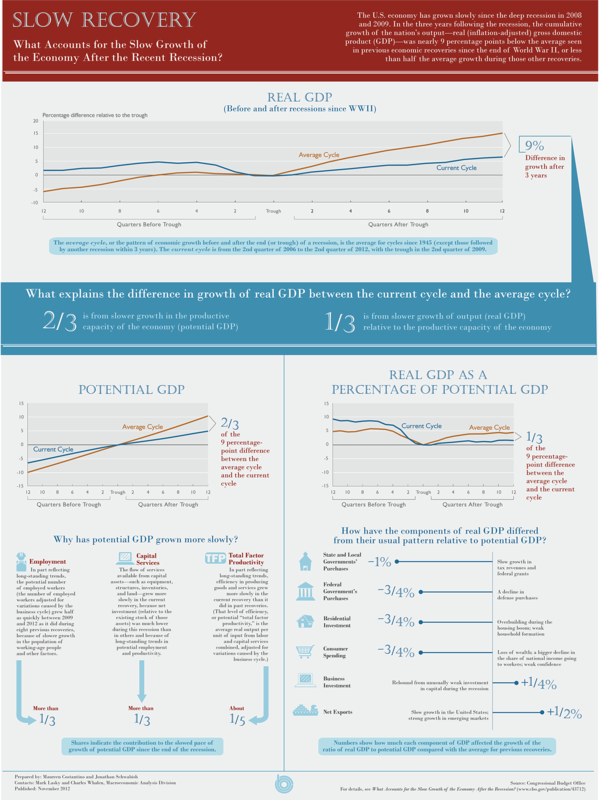 For more on GDP vs. GDI, see Dean Baker and Binyamin Appelbaum. North Korea isn’t just dark. If you look at the nation’s per capita income, it’s clear that the economic situation has gotten darker. Note that Kim Jong Il took power in 1994. P.S. Data about North Korea’s economy are, of course, spotty and incomplete. 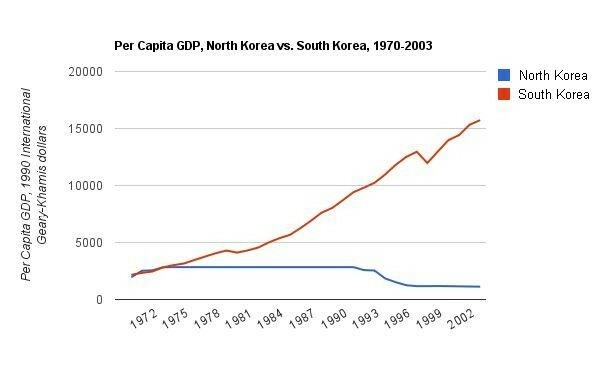 That’s why the line for North Korea is so flat; in many years, reported GDP per capita doesn’t change. So take the specifics with a grain of salt. But the overall picture remains the same.